With Valentine's day just around the corner I thought it would be the perfect time to blog about a story I have been wanting to write for a while now. I guess I should start by saying, have you heard about the engagement chicken recipe? Now the first time I heard about this story was around the coffee machine at work. For those that know me well it is no secret that I definitely give Mr Steph a few nudges when it comes to (as Beyonce so elegantly put it) "putting a ring on it". It's to the point now where it's a little bit of a playful joke ... well a playful joke that actually means "Ok, why am I still waiting?!" A colleague says to me, "Have you heard about engagement chicken?" I reply with a look of bewilderment. Now he himself looks a little puzzled. "I don't know ... maybe it's something from Iran -" his home country "- I just remember hearing about this chicken recipe called engagement chicken. Apparently if you make this dish your man proposes to you soon after ... maybe you soon try this on Mr Steph!" I laughed along with him, but I was also very curious about a dish that could have some sort of pulling power of this magnitude. We left the kitchen and walked back to our desks, with him vowing to find out about it for me. A few months later I had forgotten about it, had moved jobs and was settling into a new position. Suddenly my ex-colleague sends me a link out of the blue with a simple note: "Here's that engagement chicken recipe!" It was a link to a wikipedia article about the origins of the Engagement chicken recipe - and I must say it has a very interesting story! 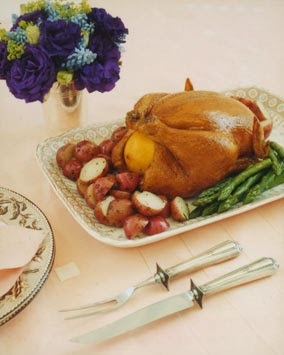 26 years ago Kim Bonnell, at the time the fashion editor of Glamour Magazine, developed a roast chicken recipe after a trip to Italy. 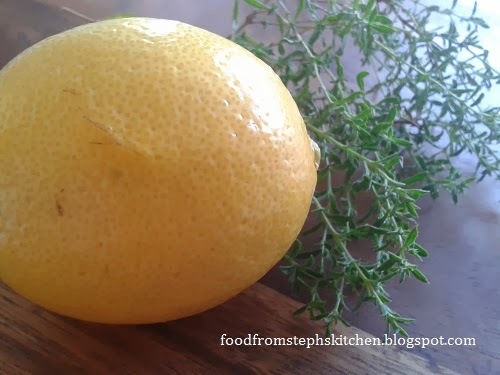 She passed the simple lemon and herb roast chicken recipe to her assistant who soon after made it for her then boyfriend. A month later the assistant was engaged! The recipe soon made its way round the office, with another three women getting engaged soon after they made the dish. In 2003 the recipe was dubbed "Engagement Chicken" and published in Glamour Magazine. Letters from readers soon followed with stories of how they were now engaged after the making the recipe as well. Have I got you curious yet? The recipe does sound quite delicious, but there are many other recipes that are equally as good I'm sure. So what makes this one different? According to the then-boyfriend of Kim's assistant it was a meal a wife would make and "It got me thinking." So for all of you out there who are like me and just hoping that it happens sooner rather than later, how about you throw your fate in the hands of Engagement Chicken? I will eventually make this myself ... I may just have to wait a while as Mr Steph is a reader of my blog, and knowing him if I made it - even if it did make him want to propose - he'd wait longer just to torment me. He's bit of a stirrer, and I think he's waiting until I don't expect it. Hopefully in a couple of months he's forgotten about it and I can make it - letting the magic of "Engagement Chicken" do it's work.